The cheesy 65 recipe is about spicy cheese appetizers which can be savored with warm cups of tea/cheese. Or rolled in a chapati for a quick bite. Combine red chili powder, garam masala powder, and food coloring with salt with yogurt. Well Bhagakar. Combine Maida, cornstarch, a little salt, and pepper powder together. Cut the cheese in long thick strips. Dredge cheese in flour. Stir the excess flour and shallow fry in the medium-hot oil stick on the skillet until golden on both sides of the cheese. Remove from pan and drain excess oil on paper towels. 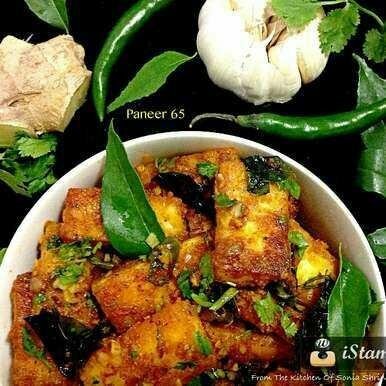 While frying the paneer, take another pan and heat the oil in the pan. Add ginger, garlic, green chilies, red chili flakes, and curry leaves and fry immediately. Toss. Add paneer and throw gently. Add the yogurt mixture to the pan and coat the paneer well. Toss gently. Turn off the gas and add coriander leaves. Mix well. You got a 19.81% upvote from @upmewhale courtesy of @jumi!